An important vote is going to take place tomorrow, Wednesday, February 13. The Senate will decide whether we stop the CIA’s use of “enhanced interrogation techniques” — or as we would call them, torture. Section 327 of the Intelligence Authorization Conference Report (H.R. 2082), would prohibit the CIA from using abusive interrogation techniques (such as waterboarding) by requiring the CIA to comply with the Army Field Manual while conducting interrogations. The Army Field Manual prohibits torture and cruel, inhuman, or degrading treatment. Please call your Senators now — and urge them to support Section 327 of the Intelligence Authorization conference report. Call the Capitol switchboard at 202-224-3121 and ask to be connected to your Senators’ offices. You can also go to the NRCAT website (www.tortureisamoralissue.org) and click on the link in the upper right red box. It will take you to a page that makes it easy to email your Senators. This is the most important anti-torture legislation now before Congress with a real chance of passage. (The House has already passed this bill.) Every phone call counts. Thank you for all that you do to end U.S.-sponsored torture. See the BBC report on the interview here. Check out a trascript on IntLawGrrls here. The full audio is available here. Remember how water(boarding)gate all began because Michael Mukasey, then nominee for Attorney General, refused to categorically say that waterboarding was torture back in October 2007? Well, today, Mukasey apparently added beatings, electric shocks, and the rack and screw to his moral and legal ambivalence list. Testifying before the House Judiciary Committee on February 7, 2008, Attorney General Michael Mukasey reached a new low, refusing to say whether even the “beating” of detainees would be unlawful and criminal. Watch the video of Mukasey posted by us by clicking on the image below left. 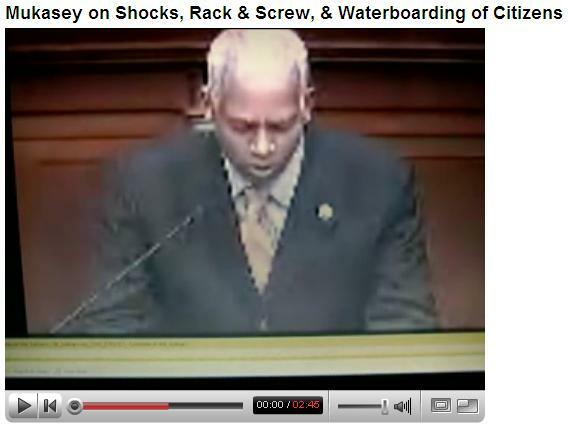 Today, Mukasey also refused to answer whether a U.S. interrogator could use the rack and screw or electric shocks. Finally, Mukasey did not respond whether it would be illegal for a foreign government to subject a U.S. citizen to waterboarding. Watch the video of that exchange posted by us by clicking below right. Attorney General Michael Mukasey testified before the House Judiciary Committee (HJC) this morning. John Conyers: Any additional comments about waterboarding now that Hayden confirmed it? Michael Mukasey: Do you have a particular question? John Conyers: Are you ready to start a criminal investigation? Michael Mukasey: That’s a direct question. No, I am not. Whatever was done as part of the CIA program, was part of DOJ opinion, through OLC, permissible under law as it existed then. For me to use occasion of disclosure that that was once an authorized part of the CIA program would be for me to tell that they will now be subject to criminal investigation. That would put into question not only that opinion, but also any other opinion from DOJ. That’s not something that would be appropriate and not something I would do. Ladies and gentlemen, behold the Nuremberg defense (“Don’t punish me for my atrocity. I was only following orders.”). Mukasey has already been accused of invoking the Nuremberg defense on behalf of the Bush torturers by Senator Sheldon Whitehouse. The stream linked to above is provided “By Direction of the Chairman” John Conyers, according to the HJC website. Curiously, we currently could not find a webcast of the hearing on C-SPAN, despite the obvious importance and interest in the meeting. 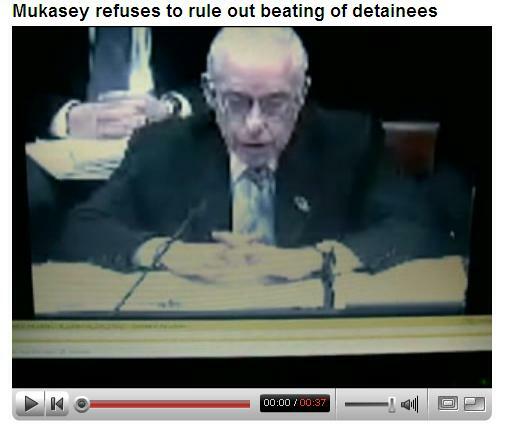 Mukasey invokes Nuremberg defense again to justify not investigating the CIA waterboarding. Representative Delahunt protests. The Nuremberg defense cannot help those who tortured or authorized torture. Reliance on an unreasonable legal opinion should not be sufficient to insulate an individual who committed a crime. Furthermore, the person who authored the legal opinion may also be criminally liable. Also, according to the Miami Herald, the Department of Justice (DOJ) itself is currently prosecuting a lawyer for having issued supposedly erroneous legal opinions that supposedly to further a criminal conspiracy. Regardless of the merits of this case, it shows that the DOJ believes it is legitimate to prosecute lawyers for having issued legal opinions that it believes formed part of criminal activity. Why then won’t the DOJ prosecute John Yoo, Steven Bradbury, or Jay Bybee? Just because they were/are DOJ lawyers? Are DOJ lawyers asserting that they can enforce the law but are themselves above the law? The White House continues to push for the confirmation of torture memo author Stephen Bradbury to the Justice Department. U.S. running of secret prison camp inside Guantánamo revealed. CORRECTED: The transcript of the White House press briefing is out now. Assuming that transcript to be correct, White House spokesperson Tony Fratto stated that Department of Justice (DOJ) lawyers approved waterboarding, but not necessarily, as the Associated Press had reported, that “waterboarding’s use in the past was also approved by the attorney general.” Regardless of whether John Ashcroft himself approved the torture (and he may well have since important opinions of the Office of Legal Council should get reviewed by the Attorney General), DOJ lawyers apparently did, making them potentially liable for torture and war crimes. Fratto made this admission about the DOJ lawyers as part of the White House’s recent push to publicly defend waterboarding as both legal and justified. However, in doing so, Fratto has confirmed that the administration’s defense of the CIA’s use of torture is based upon the fact that the waterboarding was approved at the highest levels (maybe the president signed off on it too?). As Senator Sheldon Whitehouse (RI) noted when questioning Attorney General Michael Mukasey last week, this amounts to nothing more than the Nuremberg defense (i.e. claiming that what one did was not illegal simply because one was ordered to do it). The Nuremberg defense was rejected at the time of the Nazi trials. In U.S. and international law, no one is required to follow an unlawful order. On the contrary, an unlawful order must be resisted. Yesterday, CIA chief Michael Hayden told Congress in an open session that three detainees had been waterboarded by his agency. Human Rights Watch’s terrorism and counterterrorism director, Joanne Mariner, described Hayden’s testimony as “an explicit admission of criminal activity” and called for an investigation. Senator Richard Durbin (IL) has also called for an investigation. As argued in a previous post, Congress must push for a special prosecutor if it wants the investigation conducted seriously, since Mukasey has demonstrated his lack of will and ability to take on the issue of torture responsibly. UPDATE: Amnesty International is now also calling for a full, independent, and prompt criminal investigation.